Celebrating the life of Roger Lee Justice Sr.
Obituary for Roger Lee Justice Sr.
Roger Lee Justice, Sr., age 73, passed away Thursday April 4, 2019 in Winchester, KY. Roger was born May 19, 1945 in Pike County to the late Fonso and Ida May Justice. Roger graduated from Belfry High School and married Lorraine Rutherford also from Pike county. He joined the United States Army spending tours at various posts in the United States and Korea. Upon release from the Army, he worked in the coal industry and held many positions during his career in the coal mines of Pike county. As his life moved on Roger and Lorraine traveled and lived all over the country before returning to Berea where he’s called home for the last 20 years. Roger enjoyed the outdoors and was an avid hunter, fisherman, and loved camping. His favorite hobby was woodworking taught to him by his father, Fonso Justice, and he maintained that tradition by teaching his grandsons the craft. 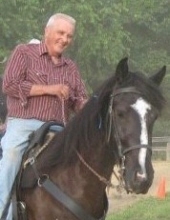 His interests stretched much further than woodworking, he loved animals especially horses. The most important to him was his family. He spent later years of his life surrounded by his children, Roger Lee (Teresa) Justice, Jr., Lisa (Jeffery) Stevens, Rachael Weaver, grandchildren, Alicia McMullin, Corey Justice, Joshua Stevens, Roger Summers, Shawn Summers, great grandchildren, Shelby Wells, Abigail Wells, Kira Stevens, Madilyn McMullin, Aria Justice Ronan Stevens, and his siblings Shelia (Morgan) Coleman, Bruce Justice, and Ruby (Donnie)Fraley. The later part of his life he shared with Elaine Cassidy, whom he married. Elaine loved him and brought him a great deal of joy and he often commented to her of his happiness, his closeness to the Lord, and the love of his family. Even though his body was failing his spirit was strong when he passed. To send flowers or a remembrance gift to the family of Roger Lee Justice Sr., please visit our Tribute Store. "Email Address" would like to share the life celebration of Roger Lee Justice Sr.. Click on the "link" to go to share a favorite memory or leave a condolence message for the family.